1. The numero-uno cardinal potluck rule: Never, ever, comment on the food you just tasted unless to say it is delicious. Simple as that. Break this rule and you will live to regret it. 2. Likewise, never, ever scrunch up your nose after tasting someone’s…interesting…casserole dish. Puh-puh-puh-poker face, baby. 3. Take extra precaution in the handling and cooking of your food for a potluck. I don’t know about you, but the thought of giving salmonella to my entire church body in one fell swoop is the stuff of this Baptist woman’s nightmares. In fact, this is true not only at potlucks, but at any church gathering or if anyone in the congregation is sick or just had a baby. Never make another lady’s prize recipe unless you are making it for your own family. And again, when you do make it for your family, make sure they know, this is Megan’s Lasagna. I personally have dibs on my potato soup recipe, snickerdoodles, granola, mini cheesecakes, lemon blossoms, sugar cookies and gooey butter cake. Feel free to make them at home, but if you bring these to a potluck or to a sick person in our church, you are dead to me. 5. This is just my own personal opinion, but…why’d you have to go and put cottage cheese in that perfectly delicious looking jello salad? Your salad is now dead to me. 7. At our church, we always let the elderly line up first, and encourage the children to go last. A perfect teaching opportunity, don’t you think? 8. We used to have a Pee-Wee Herman video that included a short movie in it about a boy named “Mr. Bungle” who always heaped lots of food on his plate at school and chose the largest piece of chocolate cake in the line-up. In other words, show some restraint, Miss Piggy. This is a potluck, for crying out loud, not an all-you-can-eat buffet. 9. Unless otherwise engaged in important or fruitful conversation, don’t be a lazy-britches and sit around smacking your fingers while the kitchen ladies are cleaning up after a large meal. Look to the ant, thou potluck sluggard! (I’m pretty sure that’s in Proverbs somewhere). 10. But then also be sensitive to the old truth of “too many cooks in the kitchen.” If you find yourself with nothing to do and are causing a major traffic jam in the kitchen while you stand there and gab, move on, sister! 11. And finally, in a modern church age where potlucks are slowly being replaced by trendy coffee-bars and fancy cook-outs, remember…you’ve got to fight. For your right. To potluck. (…Did I just reference the Beastie Boys in a potluck article? Excuse me for a moment while I try to process this surprising turn of events…). Okay, I’m back. And what I mean is…don’t really fight. But don’t let my favorite meal die. Potlucks are nostalgic. They’re fun. And they’re tasty, too! But we’re not saying anything about that, are we? Want to remember this extremely important article? Pin it! Love you, Mrs. Gore. We still do potlucks at our church, on third sundays. I love them, my children love them, my hubby not so much, but he indulges me. I love your etiquette rules. For sure, do not comment, unless it is praise, it will come back to bite you! Such sweet fellowship with the body, when we linger around at church and eat, and visit! I love that you mentioned Gooey Butter Cake! I am from Saint Louis, the home of the Gooey Butter Cake, and I have found that most people do not know the delight of this decadent dessert. 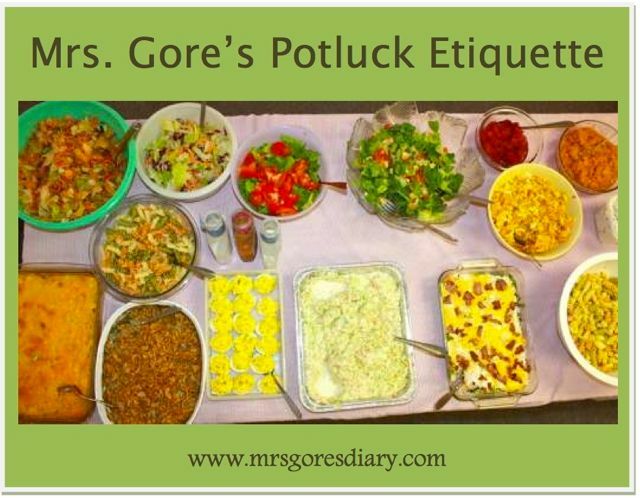 I just love your blog, Mrs. Gore! I am only nineteen years old, but I absolutely love reading about your darling children and how you’re raising them to have a relationship with Jesus. That is the most important thing! Although, I am also pretty much obsessed with the way your dress them, too. My family has had to navigate pot-lucks with care. We live with food allergies and cross contamination is a nightmare at potlucks. As soon as a spoon is crossed from one dish to another, it is dead to us. Now that I am a seasoned navigator at pot lucks, I never eat food that was brought by someone who complained about the nut-free request. I realize that every other household is already cross contaminated. I ask for recipes so that I can know that they are safe. Oh, Lesley, this had me howling!! So true in so many ways!! So glad I read this before attending a potluck. I would have brought Gooey Butter Cake (my mom’s family is all from st. louis) and would then have died when I got home and read this post. Haha! =) Missed seeing you last night at the ball fields. Obviously, you were the wiser one in this 1000 degree heat! I should have come last night – especially since Betsie ended up staying up until 10:20! I heard there was even a slight breeze by the second game. I found this on accident. Our circle of friends do pot lucks at least a few times each month. Of course I had to share this on our group page A Daily Dose of Grace. Thank You! Never, never, never take more than you can eat. It drives me to utter distraction to see somebody – usually a child, unfortunately – pile their plate and then toss half of it. You can always go back for seconds.